Prime Minister Narendra Modi and his Swedish counterpart Stefan Löfven agreed to take the relationship between India and Sweden to new heights with specific focus on trade, technology and security. 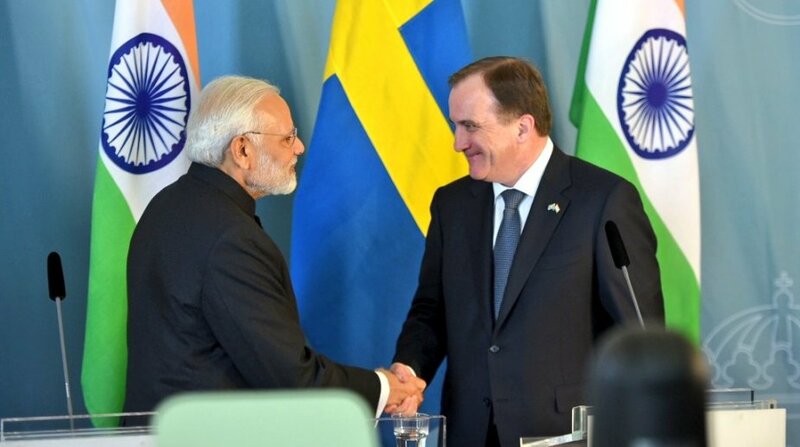 In a joint statement issued on Tuesday, PM Modi highlighted Sweden’s role in the Make in India initiative and thanked Löfven for his personal interest in India’s ambitious plan. The Swedish PM acknowledged India as a “global power” and praised India’s smart city initiative. “No important global conversation, be it on climate change or sustainable development, is complete without the voice of India,” said Löfven. “We now have a joint action plan and we are building on our joint statement issued in Mumbai two years ago. We are focussing on subjects like renewable energy, urban transport and waste management,” he added. PM Modi said that Sweden has been a very strong partner of the Make in India campaign right from its inception. “In 2016, PM Löfven came to India with a huge delegation to the Make in India programme,” the PM said referring to the Swedish PM’s visit to Mumbai in 2016 while expressing his thanks. “The biggest Make in India programme organised outside India was in October 2017 in Sweden,” Modi pointed out underlining the significant spot Sweden has in India’s plan to become a manufacturing powerhouse. Both PM Modi and PM Löfven identified defence as an important area in India-Sweden relationship. The two nations agreed to set up a common task force in cyber security. “It is important for us to discuss the common challenges in our respective regions with India. The EU-India strategic partnership holds great potential and I do hope that negotiations on investment potential can be launched,” said Löfven following the signing of various agreements. Recognising Sweden’s place as a very old partner in defence, PM Modi said that the two nations will continue finding new opportunities in cooperation in various sectors including defence. PM Modi, who embarked on his three-nation Europe tour on Monday, arrived in Sweden in the evening yesterday. He was received at the Stockholm airport by the Swedish Prime Minister. Earlier today, PM Modi called on Swedish emperor Carl XVI Gustaf at the Royal Palace in Stockholm. He is set to hold discussions with some of the leading CEOs in Sweden for trade talks. India and Sweden will on also co-host the first ever India-Nordic Summit, where, apart from Narendra Modi and Löfven, the Prime Ministers of the other four Nordic countries of Denmark, Finland, Iceland and Norway will also be present. Modi’s visit is the first by any Indian Prime Minister in the last 30 years. The last visit to Sweden was by Rajiv Gandhi in 1988. The Indian Prime Minister will depart for London tonight after addressing the Indian community event at Stockholm University. In UK, the PM will hold a bilateral summit with British Prime Minister Theresa May on 18 April. On April 19-20, he is scheduled to attend 2018 Commonwealth Heads of Government Meeting (CHOGM). On 20 April, the PM will fly to Germany where he will meet German Chancellor Angela Merkel.